And why China invited me to be there! In the history of table tennis, 1971 was a very significant year. In 1971, China stunned the world when they invited the England, United States of America, Canadian and Colombian table tennis teams to visit them for a series of friendly table tennis matches. 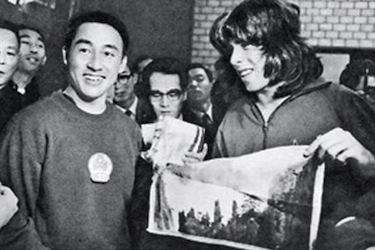 So I asked a good friend of mine, Tony Clayton (pictured right), who was part of the England team invited into China in 1971, to share his memories of this historic time in the history of table tennis ... and reveal how the media around the world covered the story with the universal headline of Ping Pong Diplomacy. On 16 May 1966, Mao Zedong (also known as Mao Tse-Tung), Chairman of the Communist Party of China, launched their Great Proletarian Cultural Revolution. Chairman Mao wanted to remove the capitalists who were considered to be weakening his power within the party and the country, and to enforce communism and regain total control of the Communist Party. So several high ranking party members were removed and either imprisoned or killed, and Mao was named the supreme commander of the nation and the army. Millions of Chinese citizens were forced into manual labour, and tens of thousands were executed. The result was massive civil unrest, and the army was sent in to control student disorder. China's contact with the rest of the world at this time was limited ... and relations between China and the USA in particular were very tense. 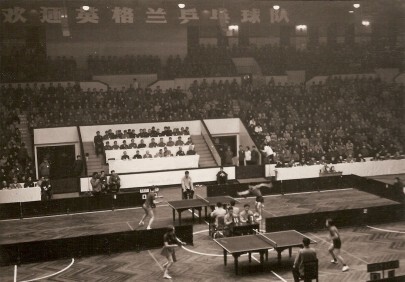 Within table tennis, the International Table Tennis Federation (ITTF) had continued to correspond with the Chinese Table Tennis Association throughout the period of the Cultural Revolution. You see, although the Chinese Table Tennis Association had only joined the ITTF in 1953, they had won multiple World Championship titles from 1959 to 1965, so the ITTF were keen for them to continue playing. However, any information about their playing activities during the Cultural Revolution was limited to information gleaned from people coming out of China via Taiwan and Hong Kong. But towards the end of 1970 and into the early months of 1971, it became known that China would be attending the 1971 World Championships in Nagoya, Japan - having not taken part in 1967 and 1969 due to the Cultural Revolution. Meanwhile, at a political level, discreet correspondence was also beginning to take place between the USA and China. So what happened next in this episode of the history of table tennis? 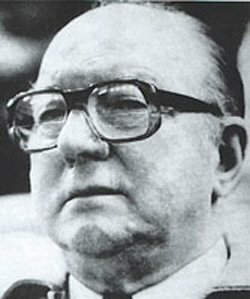 With the news that China would be attending the 1971 World Championships, the President of the ITTF (Welshman, Roy Evans) was asked by the Chinese Charge d'Affairs in London shortly before leaving for Japan in 1971, if he would be prepared to go to Peking en route for Japan. He readily agreed, primarily because China had been the strongest table tennis nation in the world in 1965. He then spent a couple of days in China, including attending a conference with Prime Minister Chou En-lai. During their discussions, Chou En-lai expressed great pleasure at China's re-entry into world table tennis, and talked of further steps they could take to re-establish themselves quickly. The President of the ITTF reminded him of the Peking Invitation Tournament they used to hold each August, and suggested its revival. He pointed out that all the strongest countries would be present in Nagoya, and that it would be a good opportunity to invite them to China after the World Championships. Richard Nixon took up office as President of the USA in January 1969 and relations between China and the USA started to ease. President Nixon also started to adjust US policy towards China and in January 1970 the two countries resumed talks at ambassadorial level. 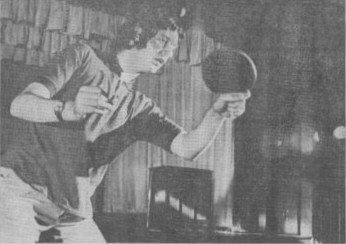 So the scene was set in April 1971 for the sport of table tennis to pave the way for friendly talks between East and West with Ping Pong Diplomacy. The most widely recounted story is that China only decided to invite the USA to visit them for a series of friendly matches because of an incident which occurred during the World Championships in Japan. 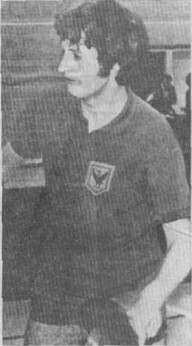 The story is that, on 5 April 1971, one of the USA players - Glenn Cowan - came out of the practice hall and was looking for one of the shuttle buses which would take him to the main tournament stadium. However, the only bus waiting outside was the one used exclusively by the Chinese entourage, and Cowan was immediately offered a ride. Cowan boarded the bus and after an initial period of silence, Zhuang Zedong, the three times singles world champion and most senior Chinese player on the bus, presented Cowan with a silk-screen portrait of the Huangshan Mountains. When they alighted from the bus at the stadium, the assembled photographers took photos of the two players together. These pictures quickly spread around the world. Due to all the publicity, Cowan thought he spotted an opportunity so he went shopping looking for a gift to give to Zhuang Zedong in return. He bought a T-shirt which had a peace symbol in the corner of a painted American flag and the words "Let It Be" underneath. This second exchange of gifts was even more widely publicised and much was made of the friendly relations between the two players, and therefore their countries. So the story is told that - following this friendly exchange of gifts, the Chinese decided to invite the Americans to China. Well ... although these events DID take place, they were NOT the real reason that the Chinese decided to invite the Americans to China. As we now know, this exchange of gifts was not the real reason why Ping Pong Diplomacy was offered. In fact, the giving of a gift to an American table tennis player by a Chinese player had been meticulously planned by the Chinese political leadership, but it was made to appear spontaneous. 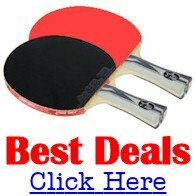 China had already planned to use table tennis as a way of reinstating political relationships between the USA and China and discreet correspondence had already been taking place between them. So although this offer of Ping Pong Diplomacy appeared to be a spontaneous act of friendship, in fact it had been meticulously planned by the Chinese leaders. However, both the Chinese and the Americans still had serious reservations about such a visit, but both countries decided to go ahead anyway. The majority of the media coverage relating to these historic table tennis matches inevitably centres around the USA and their team - who were not a major force in world table tennis at that time - and ignores the England, Canadian and Colombian table tennis teams who also took part. But it was an Englishman - Ivor Montagu - the first Chairman of the ITTF and a communist sympathizer, who helped the Chinese to use table tennis as a means to communicate with the West. He served as Chairman of the ITTF from 1926 to 1967 and made many visits to China during that time. So to get an English perspective, I've asked a good friend of mine, Tony Clayton, who was part of the England team which went to China in 1971, to share his memories of this historic time in the history of table tennis ... and reveal how the media around the world covered the story with the universal headline of Ping Pong Diplomacy. At the time, Tony was a 20 year old student at Liverpool University. "I was first reserve for the England team to go to the Commonwealth Games and the World Championships. As I was a reserve, I'd had all my injections, but naturally I never expected to go. But when Denis Neale and Chester Barnes had a dispute with the English Table Tennis Association (ETTA - now known as Table Tennis England) just prior to the trip, I was called up with only 48 hours notice. I was in the geography department when I got a message to ring the ETTA (now known as Table Tennis England). Of course, at the time, I thought I was just going to the Commonwealth Championships in Singapore and the World Championships in Japan ... but it turned into much more than that..."
Of course, prior to their historic visit to China in April 1971, the England table tennis team were competing in the 1st Commonwealth Table Tennis Championships in Singapore, before travelling on to the 31st World Championships in Nagoya, Japan. Tony managed to win a Commonwealth gold medal in the men's team event and a silver medal with Karenza Matthews in the mixed doubles. Then with his England team mates, he went on to finish in 10th position in the team event of the World Championships in Japan. A good result for what was effectively the England second team! 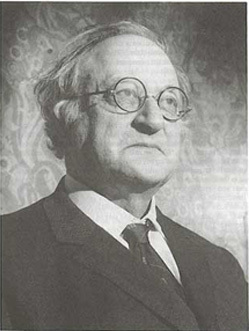 The Chairman of the ETTA, Charles Wyles, had invited the Chinese to England prior to the team leaving the UK, so he was hopeful of a reciprocal invitation. However, the last time an England team had visited China was in 1961 - for the World Championships which were held in Peking. "We were in China for 15 days in total, but a lot of the time was taken up with sightseeing. We were taken to Peking, Shanghai and Tientsin and shown around Palaces, communes, workers settlements, steelworks, watch makers, schools, department stores, markets, the Double Happiness table tennis ball factory, ballet and opera performances ... oh, and not forgetting the Ming Tombs and the Great Wall of China." 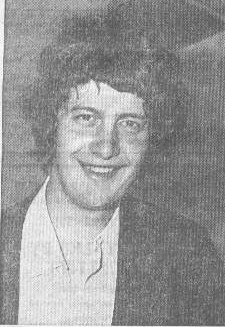 The England party included ETTA Chairman Charles Wyles, non-playing captain Brian Merrett, Pauline Piddock, Jill Shirley, Alan Hydes, Trevor Taylor and Tony Clayton. 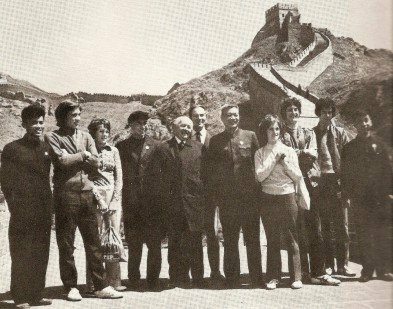 Here's a picture of the England party with their hosts at the Great Wall. (Tony is third from the right). "The Chinese were really friendly but they were very curious too. When we went into the streets we were immediately surrounded by people and they were fascinated by our clothes, especially the girls' mini skirts. We visited a school and they were digging a hole in one corner of the playground. We later discovered that it was for an air raid shelter "for when the Americans attack". They were very afraid that they'd be attacked at that time. The English lessons in school consisted of the children saying "We have boundless love for Chairman Mao" and "My father is a fighter in the People's Liberation Army". 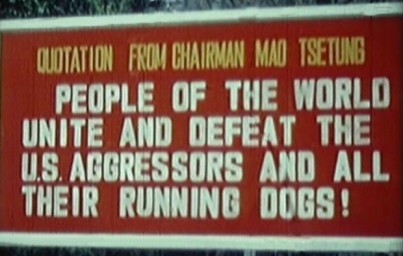 One memory I still have is of the large pictures of Chairman Mao in the streets and in particular, one very large billboard which read - People of the World unite and defeat the US aggressors and all their running dogs. But of course, we also played six matches against China, all of which attracted capacity crowds." "Peking had crowds of 23,000 but other venues only had enough room for 6,500 spectators. Every match was also attended by a number of important dignitaries ... such as the Foreign Minister, the Minister of Sport and the Vice-Chairman of the People's Council." "We won the series 4-2, but the top Chinese players were still in Japan. My game was suited to playing against the penhold style, and once I'd got used to it in Singapore, I did OK.
"It was a really wonderful experience visiting China and I think it certainly benefitted my game." So the Chinese succeeded in their aim when US President Nixon accepted an official invitation to China. Here's a short video clip of President Nixon announcing and accepting his invitation to China. And from 21 to 28 February 1972, Nixon visited China. Here's a short video clip of President Nixon arriving in China.